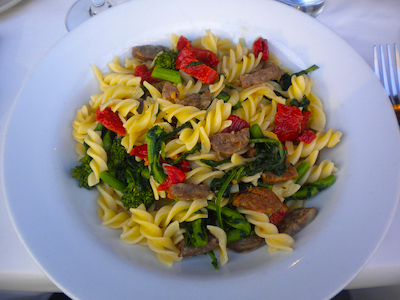 You can dine on gluten-free pasta at Pappardella! If that's not living the gluten-free dream, I don't know what is! Celiac Disease affects more than 2 million people in the United States. Avoiding gluten while dining out is imperative to sufferers, yet it’s not always easy, despite increasing awareness. Erin Smith was diagnosed with celiac disease in the early 1980s, so she’s been eating gluten-free almost her entire life. Erin has a unique perspective of growing up in the gluten-free community and blogs about living — and enjoying — a gluten-free lifestyle at Gluten-Free Fun. Today, she shares her advice. Dining out might be daunting to those who must eat gluten-free due to Celiac Disease, wheat-allergies, or gluten intolerance, but you can still dine out at restaurants while sticking to your gluten-free diet— it just requires a little homework and a lot of communication. Although my special request doesn’t go into specific details about ingredients, cross-contamination, and garnishes, I can discuss that when I get to the restaurant. Cuisine. Pick a restaurant that features a cuisine that is more gluten-free friendly. American steakhouses and Brazilian churrascaria are great options for meat-lovers and gluten-free diners. (Just be sure to talk to the staff about any sauces or gravies that accompany your meat!) Mexican, Southwestern, and Latin restaurants tend to serve corn-based dishes that are safe for the gluten-free diner. Organic and vegetarian restaurants usually have a good understand of special dietary requests including gluten-free needs. OpenTable allows you to easily filter your search to include these specific cuisines which will be helpful during your reservation process. Communication. When I make a reservation and send a Special Request via OpenTable, many times I will get an email response from the restaurant confirming my reservation and acknowledging my gluten-free meal request. The most attentive restaurants will confirm with a phone call which allows you to speak directly with someone at the restaurant about needing a safe, gluten-free meal. This opens up the dialogue before you even step foot into the restaurant. For those that eat gluten-free, don’t be shy about your condition once you arrive. Conversation is the key to hopefully allow you to eat safely. Don’t be shy about talking to the maitre d’, restaurant manager, and your server about your dietary needs. Even if you feel like you are repeating yourself, you are ultimately responsible for your health. Look at these conversations as educating the staff about what eating gluten-free means to you and future patrons. Don’t be rude about it, just be clear when explaining what you can and cannot eat. If you are more comfortable giving the staff something in writing, there are many allergy dining cards available online. These cards are helpful in explaining specifics of the gluten-free diet but should not replace a basic conversation with the staff. When gluten-free customers have a great and safe gluten-free dining experience they are very likely to be repeat customers. Happy gluten-free diners are very loyal to restaurants that they can eat at safely. Success Story. In March, I made a reservation at Pappardella in NYC for the first time. Even though I have Celiac Disease and dine out (gluten-free) often, I am always a little bit nervous about dining somewhere new for the first time. After making a reservation with Pappardella, they called me almost immediately to discuss my gluten-free needs. They made sure I knew they did not have a dedicated gluten-free kitchen but were careful about preparation. The manager also told me what gluten-free products are used in the kitchen and who to ask for when I arrived at the restaurant. This conversation before even going to the restaurant was very comforting to me, as was having a face-to-face conversation. The gluten-free meal at Pappardella was wonderful and I ate worry-free throughout the entire dinner. I will definitely return. Erin Smith has been writing her gluten-free lifestyle blog Gluten-Free Fun since 2007. In 2011, she launched Gluten-Free Globetrotter, a website that encourages those with celiac disease to travel the world and not be scared about eating gluten-free domestically and abroad. Erin is also the lead organizer of the NYC Celiac Disease Meetup group, a social community that has grown to over 1400 members in the 7 years she has been organizing the group. People with severe food allergies are ultimately responsible for themselves. I work in a restaurant and know that our kitchen will do what they can to accomodate. It’s frustating when guests come in with a long list of concerns and demands and throw us an attiude on top of it !